Since I have a lifetime membership to Champions online I was able to get into the beta weekend for Neverwinter. 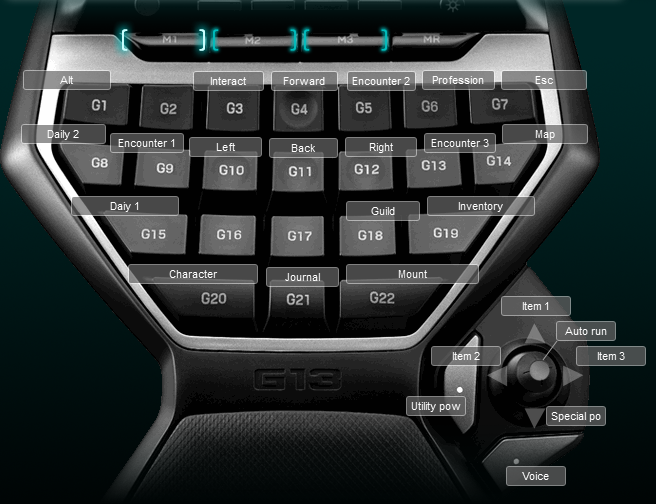 After playing 10 minutes I put together a Logitech g13 profile. The layout is simple because Neverwinter’s controls are simple. This isn’t much more than i would normally do for a FPS keyboard layout with movement and the dailies. I have found that this works very well for a Guardian, rogue and healer. I haven’t played a fighter or mage yet but I think it will still work. Below is a screen shot of the keyboard layout.